This post is sponsored by Dunkin’ Donuts. Every espresso at Dunkin’ Donuts is freshly ground and brewed for each drink and combined with steamed milk and foam in each of Dunkin’s espresso beverages. As I put a lot of thought and care into decorating for the holidays, it’s nice to know that the macchiatos from Dunkin’ that I drink as I work on the house are crafted with the same care! Popping in today with a quick tip for making your faux garland look more lush and real. I kept thinking that I needed a new garland to get the look I wanted, when really I just needed to take the time to make the one I have work. 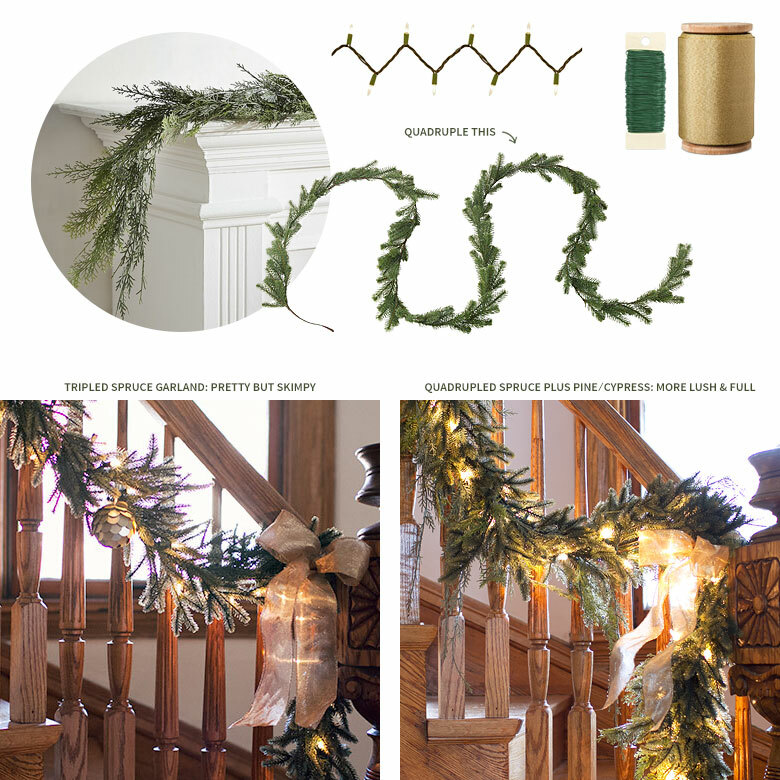 I bought a bunch of inexpensive faux-spruce garland strands years ago. They were pretty thin so I tripled them up and added lights before draping the garland along our stairs, but I wasn’t thrilled with how skimpy it looked. 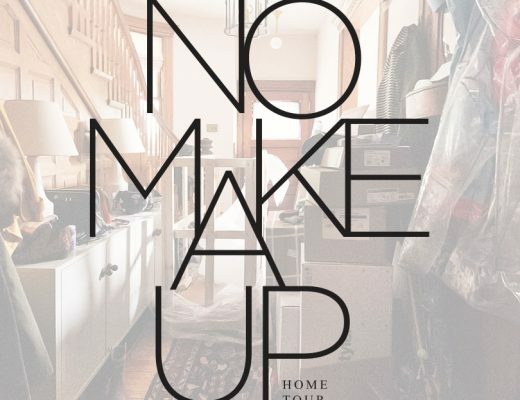 I mean, it wasn’t a big deal — it still looked really pretty, but I knew it could be better. We had fresh garland for our HGTV Christmas issue shoot, but we didn’t get to enjoy it for the holidays because the shoot was done in April! And in the short time that we did have the garland on the stairway, it had made a huge mess. With a cat, a dog, and three kids going up and down those stairs multiple times a day, anything that goes there is going to get jostled. Faux-greenery is far more hardy, so I took our so-so 30-foot garland that looked great but a little thin, and made it into something I feel really good about decorating with. I already had most of what I needed on hand: our faux-spruce garland, florist wire, clear Christmas lights, and gold ribbon. 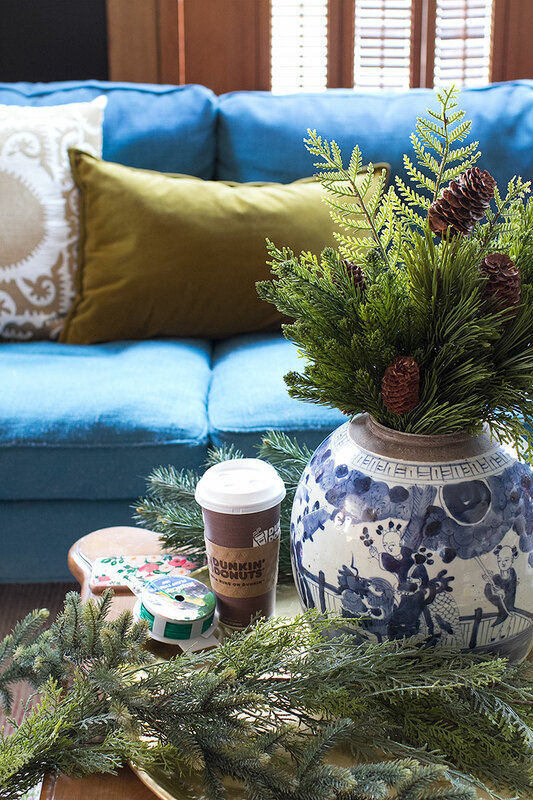 I picked up some supplementary faux-fresh pine garland (that looks more like cypress to me, but I like it) and stopped off at Dunkin’ Donuts for a mocha macchiato before heading home to get to work. I took the 100-light strand of Christmas lights off of our spruce garland and laid the whole thing out on the floor to determine spacing for the new pine garland. It was an improvement, but we still had more of the faux-spruce and I liked the added fullness it brought. I wired everything together, starting at one end and spacing the connections about 12″ apart. I then added the lights back in, wrapping them in around the center of the garland a bit more tightly and using an additional 50-light strand. 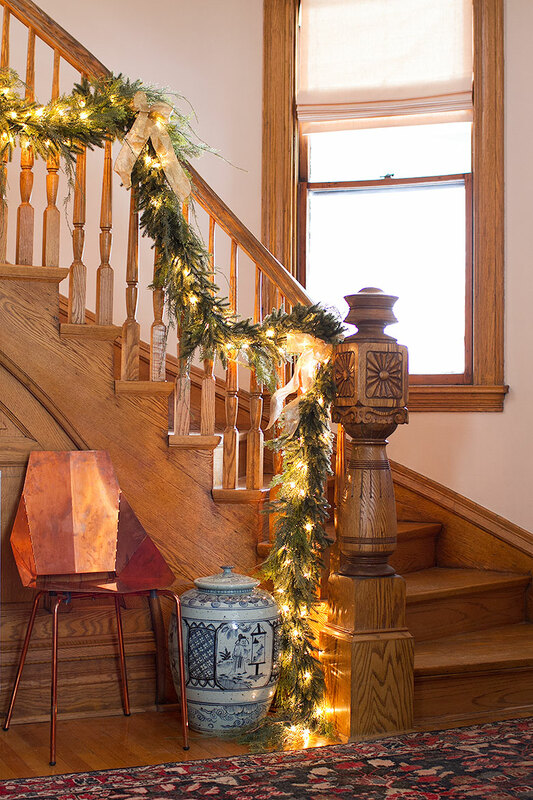 I used coated picture wire to secure the garland to the stair railing, then added decorative gold ribbon. I also added a huge blue and white oversized ginger jar to hide the cords. Terrible placement with the aforementioned three kids? Possibly. It hasn’t been much of a draw yet — fingers crossed, that continues to be the case. Once you’ve got the base of the garland right, you can change it up. I had a few ornaments in there before, but I like the simplicity of just greens with clear lights. I may change it up from year to year though. It would be pretty with Christmas picks other greenery, winterberry sprigs, pine cones, or ornaments. WOW! this looks so great! I totally assumed your garland was real, not faux, so thanks so much for the tutorial on how to make it look so lush and beautiful! Thank you! I’m really happy with the way it turned out, and now I’m excited about using it again each year. So tired of folks commenting on sponsored posts. This time it is felt that the sponsor is too tenuous. If you have EVER decorated for the holidays, you are definitely drinking something. If that is going to be DD coffee, which is very good by the way, so what? How is that tenuous? The project is great, the garland is clever and lovely, and DD coffee helped out. Not tenuous at all. Merry Christmas. This is lovely. 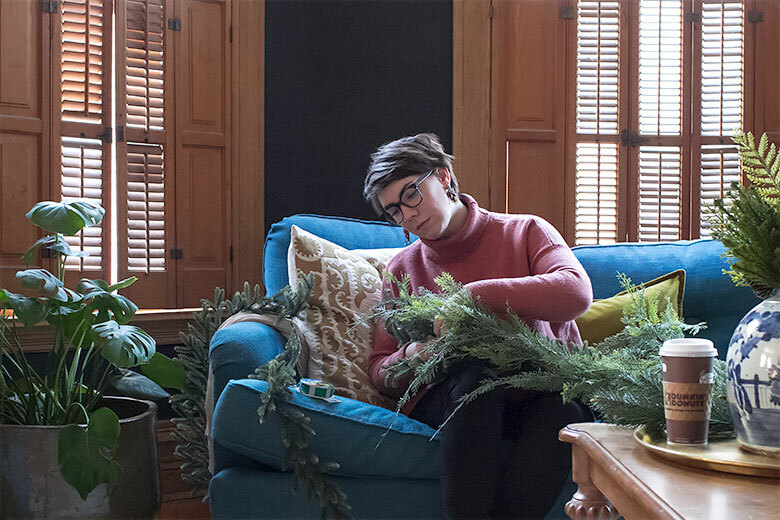 I ended up buying some real evergreen (cast offs from tree branches) for a little greenery because I didn’t have my act together to do otherwise, but next year – faux garlands for the win! Awesome! This is perfect, because I inherited a bunch of garland that is fine but not great. I could totally spiff it up with this tutorial. Love. I love decorating with fresh greenery!! Yours looks beautiful! Perfection on your fence. 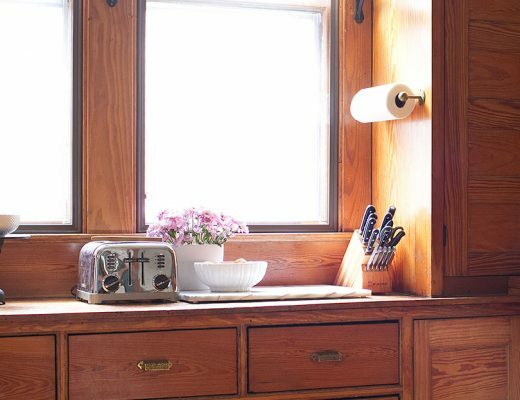 It is the perfect compliment to the natural greenery. Thanks for the tutorial. I use a lot of fresh greenery because it smells good, I am fortunate to live in a more rural area where I can forage for my own plus add my tree trimmings to it but I haven’t ever made a garland, just wreaths, swags, etc. 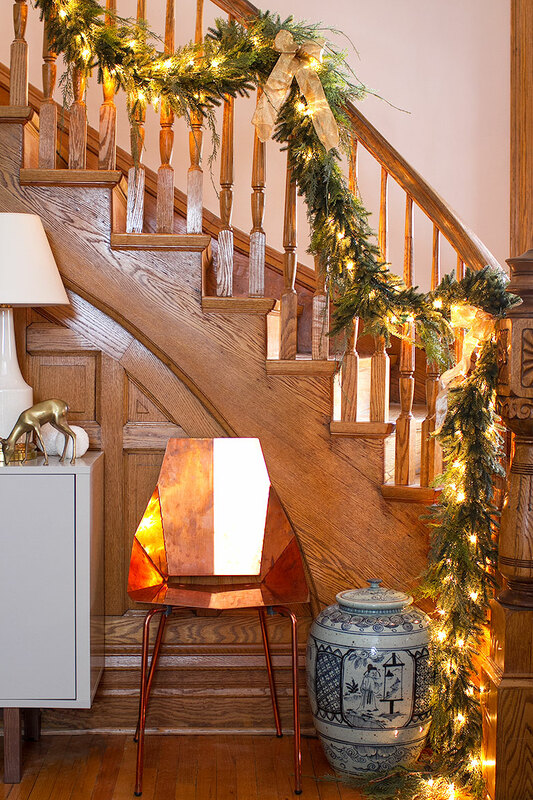 Unfortunately anything we do during the holidays has to be faux. We always got a real tree every year until my daughter was born. The last one we had was her first Christmas and that was one miserable baby. My husband had it undecorated and at the street by 6am on the 26th!